Recommended Name: � the Earlier Minchiate pattern. This pattern was originally classified as IPT-1. This pattern is found on the earliest known Minchiate cards, dating from the 17th century, and may well have been used for them from the first invention of the game. This type of pack originated in Florence in the first half of the 16th century, by 1540 at the latest. It is properly designated "Italo-Portuguese", since, while it has several "Portuguese" characteristics, it lacks others, and the pattern was presumably devised at a date when the Portuguese type was not yet thought of as constituting a distinct suit-system. By the later 17th century, it was in use also in Genoa, where it was known as Ganellini, and in Sicily, where it was known as Gallerini, the word "Minchiate" having an obscene connotation in both areas. It died out in Sicily during the 18th century, when, however, it became highly popular in Rome under the name "Minchiate", which in the 17th century had replaced the original name of "Germini". It seems to have died out in Florence in about 1900, and in Rome probably some decades earlier. This is a Tarot pack enlarged by having 40 in place of 21 trumps; they are called "tarocchi". With the Matto (Fool) and 56 suit cards, this makes 97 cards in all. The Batons have their usual Italian shape, but the Swords, though intersecting, are straight, in Portuguese fashion. There are no dragons on the aces, but in Cups and Coins, though not in the other two suits, the lowest court cards are Maids (Fantine). A special peculiarity is that in Swords and Batons the "cavalli" are centaurs, and in Cups and Coins other half-human, half-animal monsters. The Kings of Swords and Batons wear short tunics, those of Cups and Coins long robes. Of the 40 trumps the top five, called "Arie", the Star, Moon, Sun, World and the Trumpets (le Trombe) are unnumbered; the rest bear roman numerals from I to XXXV. 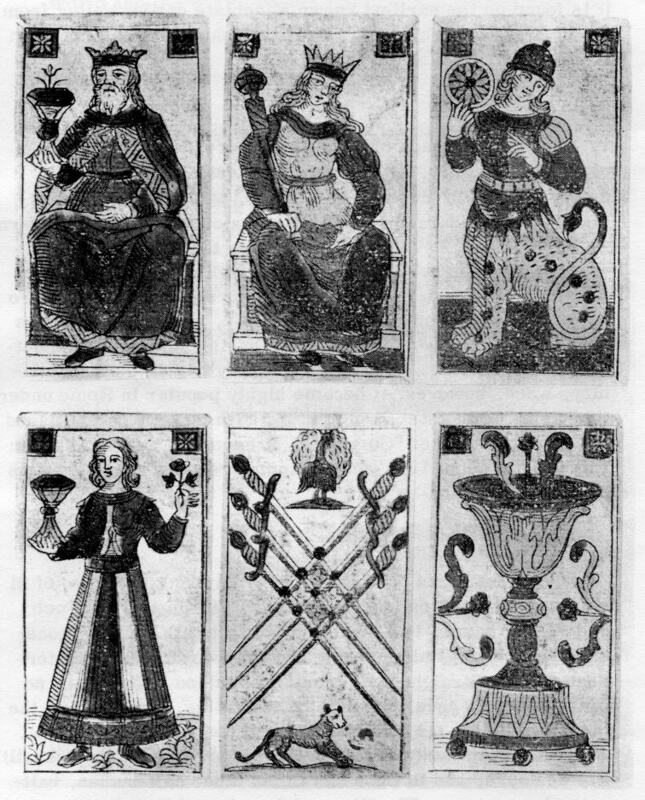 There are no Pope and Popess, though the trumps from I to V are called "Papi" (Popes); the cards from XVI to XXXV represent Hope, Prudence, Faith, Charity, the four Elements and the twelve signs of the Zodiac. The top eight trumps have red backgrounds. "Al Mondo", "Al Soldato", "Al Poverone", "All' Imperador" or "Alla Fortuna", all in the 18th century and all of Bologna. The following are probably also all from Florence: "Paragone" (early 18th century), "Poverino" (18th century) and "Etruria" or Agostini Francia (18th century). 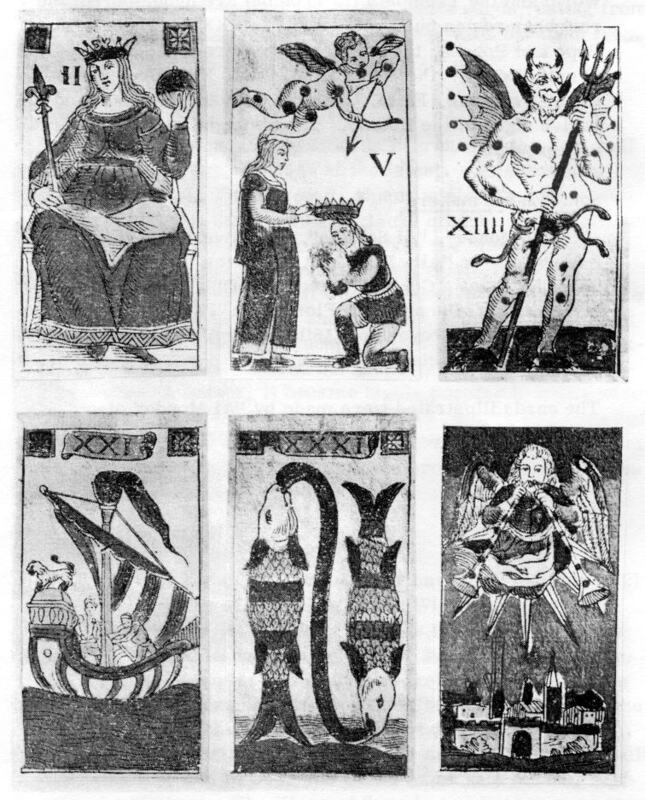 Cards made by "Al Mondo" of Bologna.